For those of you who have never had the pleasure of seeing ElJay's work up close, all I can say is it's amazing! He has a real gift for capturing the authenticity of a piece in its look and feel that is remarkable. 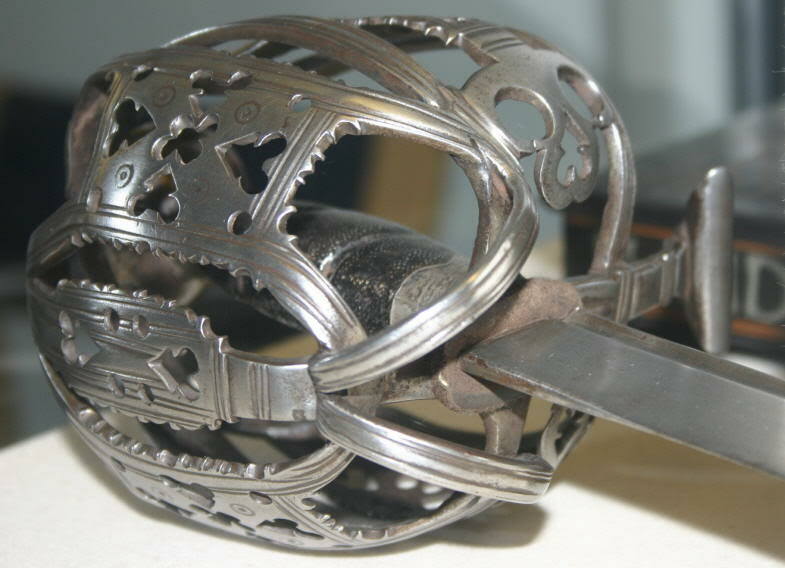 Even my wife, who has no real appreciation for swords (though I am working on her) gawked at this hilt and exclaimed, "That is a work of art!" 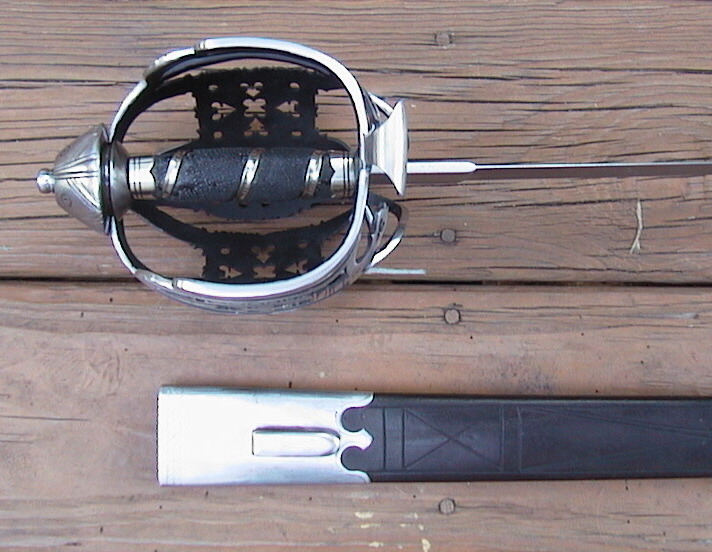 A friend mounted the hilt on a Del Tin blade that I had purchased from Donnie Shearer. 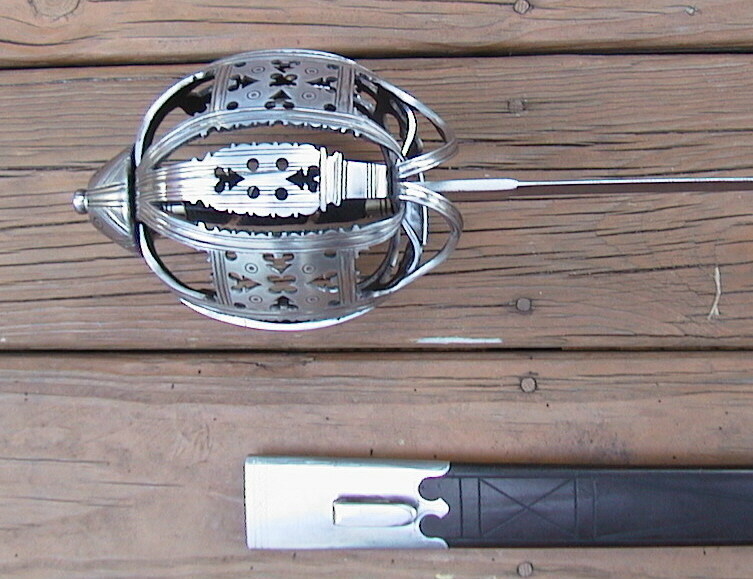 The blade and basket work well together. A little decoration added to the scabbard that Donnie supplied me, and the package was complete. But enough talk -- on to the pictures. I only wish I had a camera that could do justice to the craftsmanship of this great artisan! I'll say more when I get my jaw off the ground. What a beauty.....o.k...I think I clicked on all the photos...any chance to see an inside shot of the handle? Here you go, Ben. Sorry the photo isn't the best quality. The grip is black shark skin bound in silver. 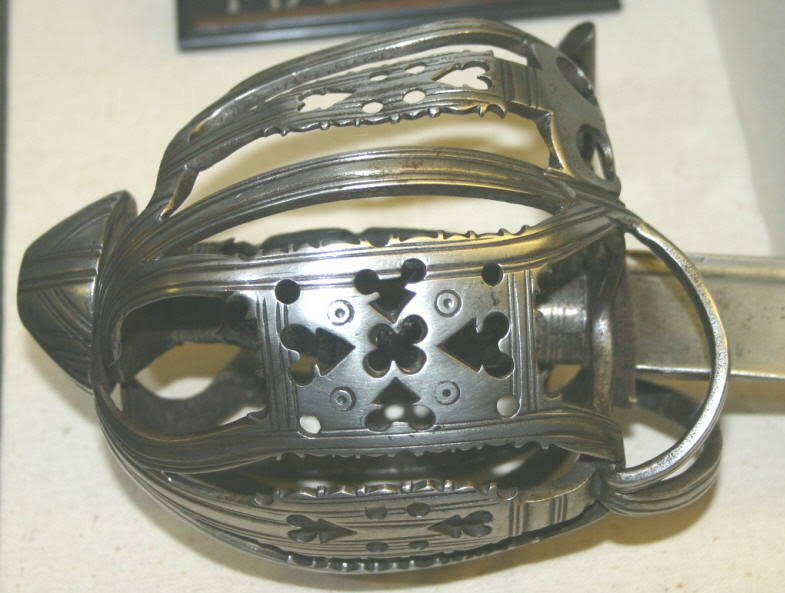 The inside of the hilt is painted a flat black to help protect against rusting. The black against black doesn't work well for my camera. Well, well, well........what an amazing piece....big 'ol congrats Chris! Guess it's show & tell time at the Goerners again huh? I'm guessing Will G. put it together for you? Did he peen it together? You'd better stick that in the car with you tomorrow, 'cause I'm a wantin' a real close, hands on, look at this beauty. Know your very chuffed about this one. Congratulations, Chris! Your new Eljay baskethilt looks like a very fine piece. I'm quite envious! 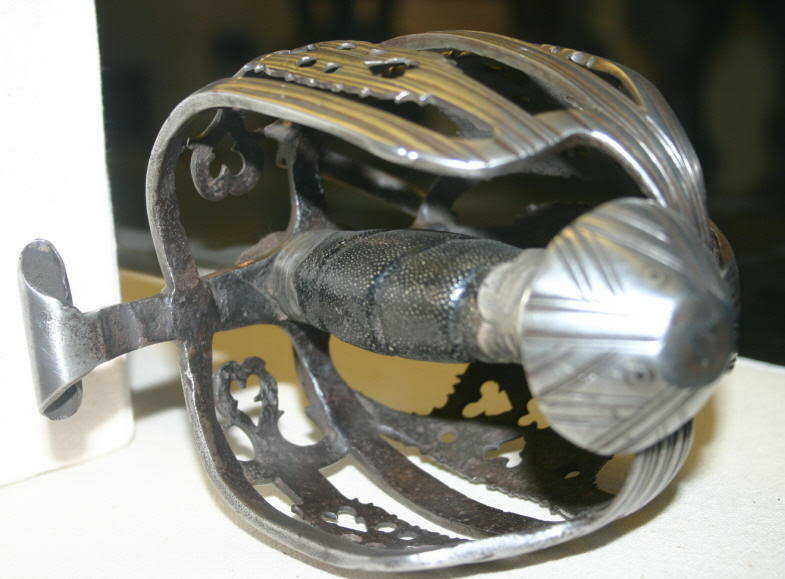 This must be the finest looking replica of a Glasgow hilt that I've seen... Lovely! Eljay's work is beautyful, as allways. How did you decorate the scabbard? Just soaking it with water and tooling it??? Absolutely stunning! Man, I need to make it back down to Roanoke sometime to visit. You've got some really nice pieces, Chris! 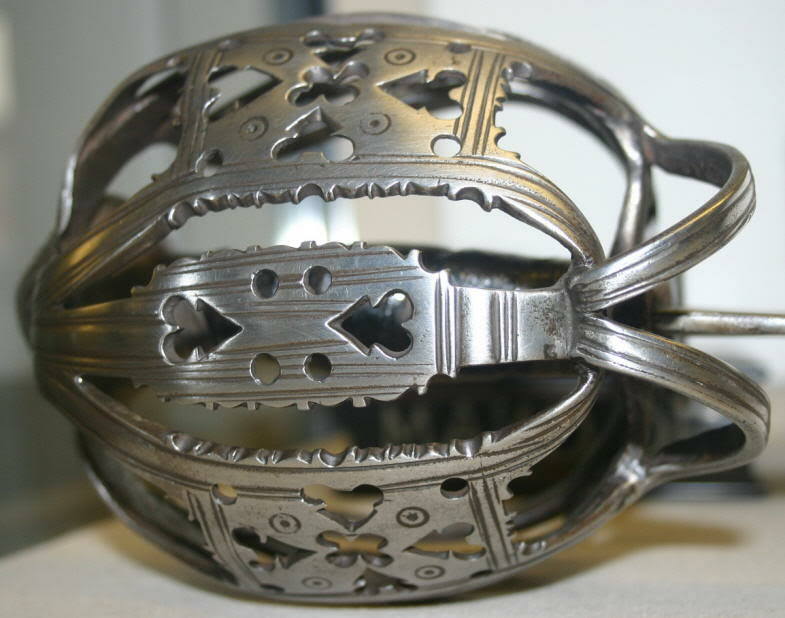 Though the hilt looks very similar to a Glasgow hilt in the photos, it is actually a Stirling hilt. 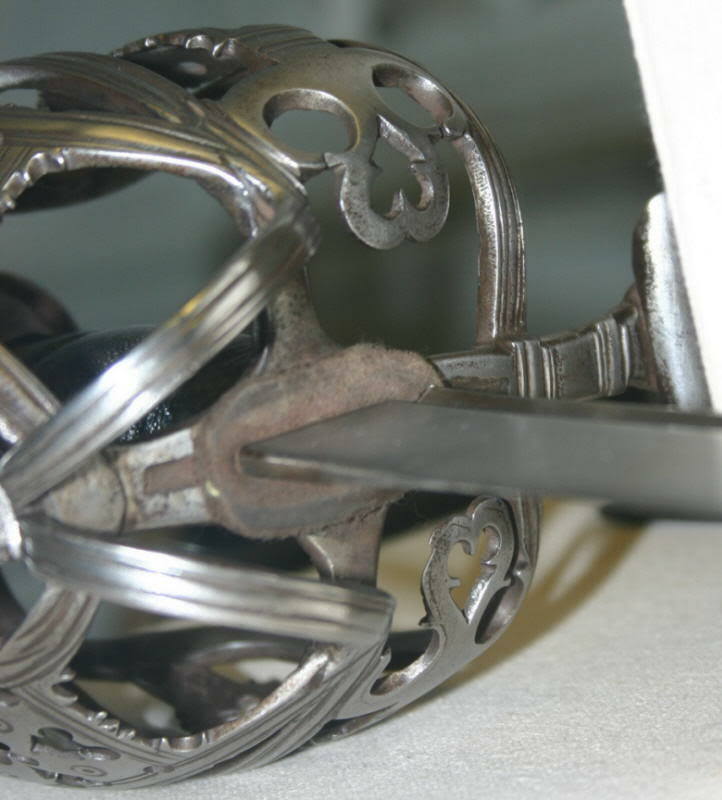 If you were to see the hilt in person, you would better be able to see that it lacks the deep center grooves on the bars of the hilt so typical of the Glasgow school. the fluting on the rear guard and additional rear guard are vertical, rather than following the curves of the guards. 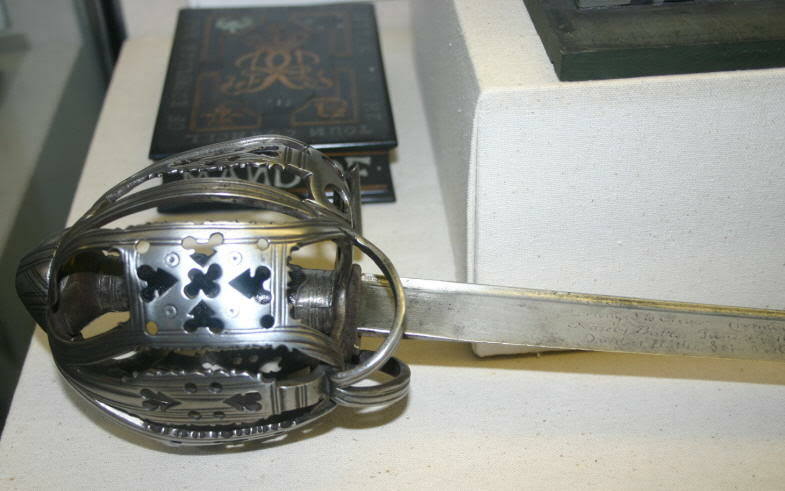 These things are hard to see in the photos, so I'm not surprised that it appears more like a Glasgow hilt. As for the scabbard decoration, I have a tool that actually cuts a shallow groove into the leather. I use it to set my stitching below the surface of the leather, cutting down on the amount of wear the thread is exposed to. I often use this tool for decoration as well, as I did on this piece. I'm guessing Will G. put it together for you? Did he peen it together? Yes, your long lost twin, Will Goodwin, is the one who helped assemble the sword for me. 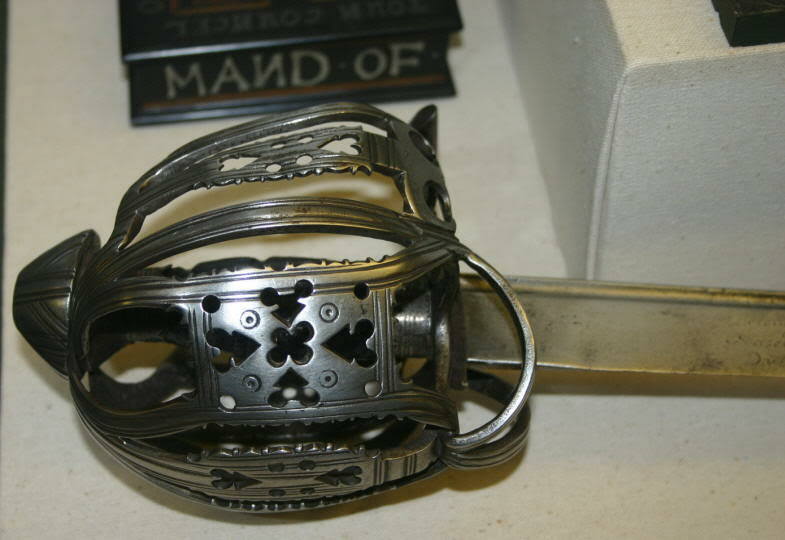 He had quite a bit of material to remove from the tang to match the pattern ElJay sent with the hilt. Instead of peening the tang, he threaded it, which I prefer. I will definitely bring it along tomorrow for show and tell. See you then! What an excellent version of that beautiful Stirling basket .... Eljay really captured its fine details! I've added your new piece to my PictureTrail album of "Baskethilts by E.B. Erickson". I had the pleasure of meeting Eljay this past week and he's as nice a guy as you'd ever hope to meet ! *He'd mentioned he'd done this piece for you when I was showing him pictures of my Scotland trip and came across that one ! 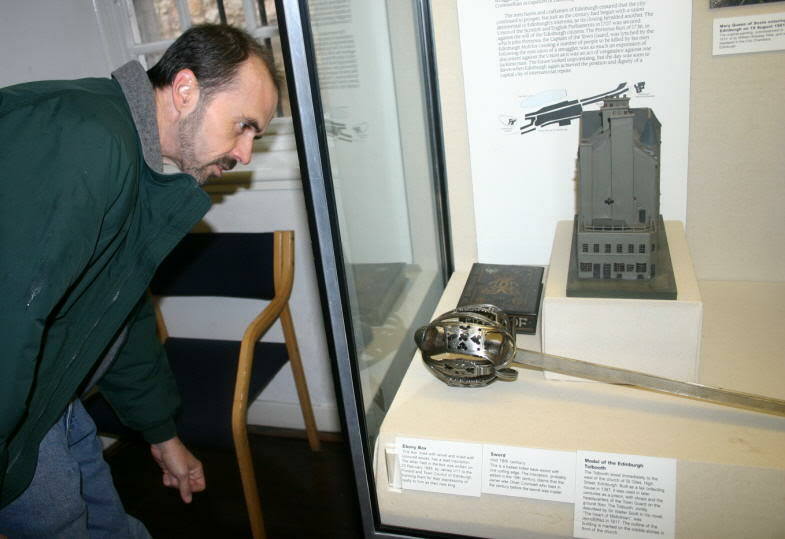 *Photos: T. McDonald, 2005 - Edinburgh Museum, Canongate. Absolutely stunning... Eljay is an artist of singular talent. Every time I see the fruits of his labors, I calm myself and repeat my mantra: "Someday... Someday... Someday". Got to put me grubby paws on this sword today. WOW! is all that needs to be said. Thanks Chris for bringing it. In the pictures of the original it is easier to see how the fluting really is. Thanks for sharing the pics, Mac! 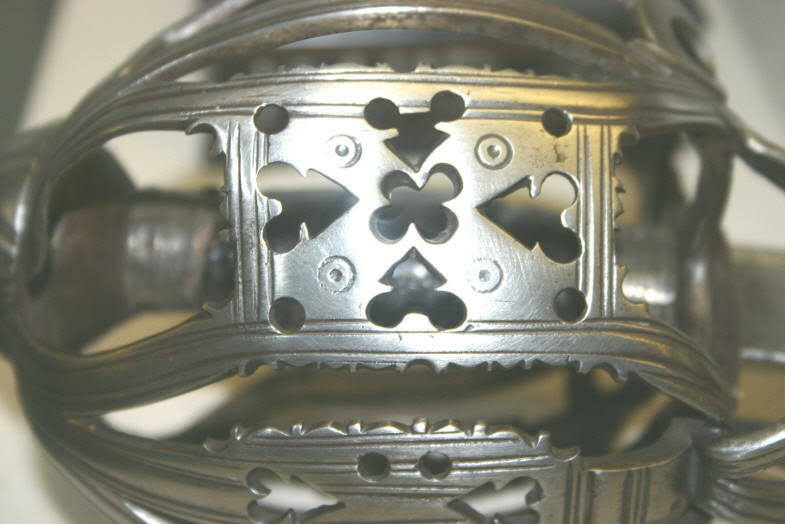 Also, hilt has wider bars than one would expect from a typical Stirling hilt, making it appear more like one of its Glasgow counterparts. Without having good quality photos to pick up on the details, I can see why you would have guessed Glasgow. Aye, Chris .... I guess you'll just have to send it to me to photograph for you ! Here are a few more photos of the original I snapped that day ! HAHAHA! I'll second that! Send it to Mac for a photo-session! Thanks for posting the pictures, Mac. 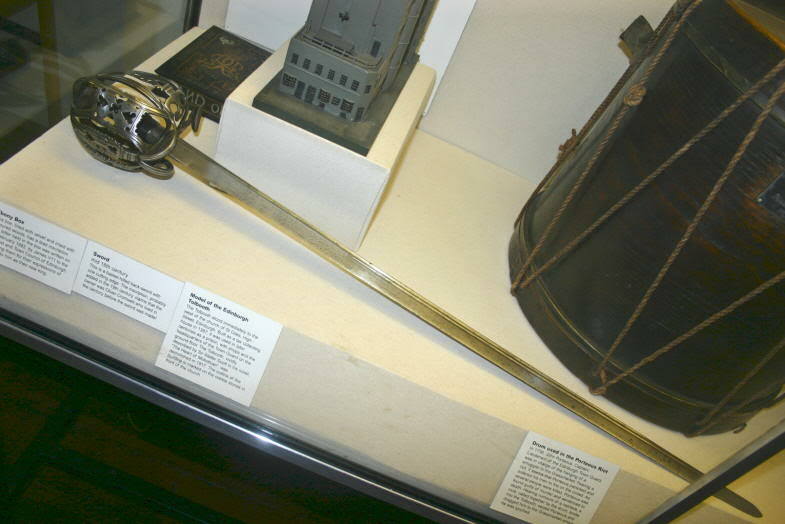 It's a lovely looking sword. Do you know what the actual inscription says? 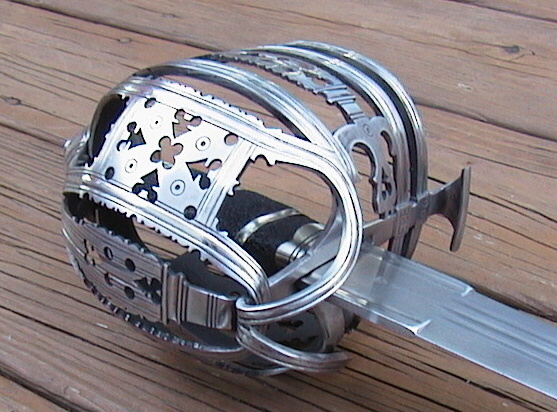 And another thing; the bars seem to terminate pretty far on the "front" side of the pommel (on the original). Is this normal? 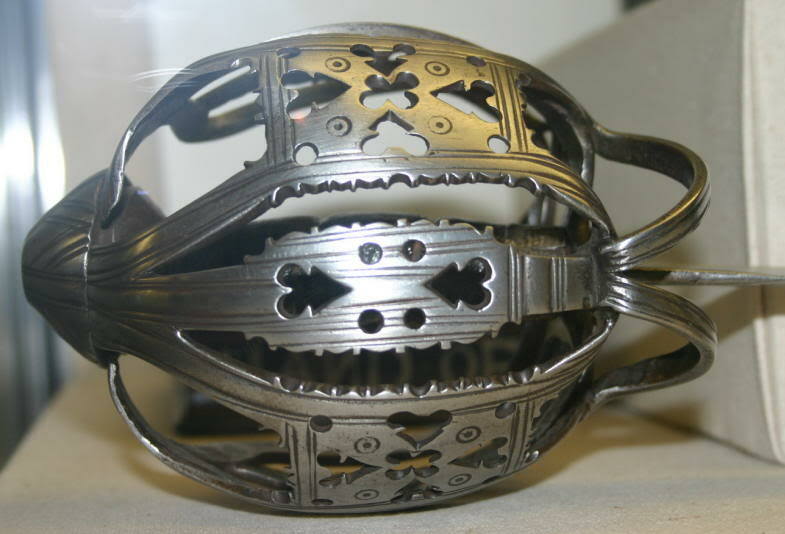 "Belonged to Oliver Cromwell Lord Protector"
The next lines are famous battles & dates of his, with the Puritan war cry giving "Praise" to the "Lord of Hosts"
As far as the hilt goes, it does seem to be a bit off kilter ! My guess would be that either this is not the original blade, and was fitted poorly, or that it got bent and tweaked at some point and was never corrected ? 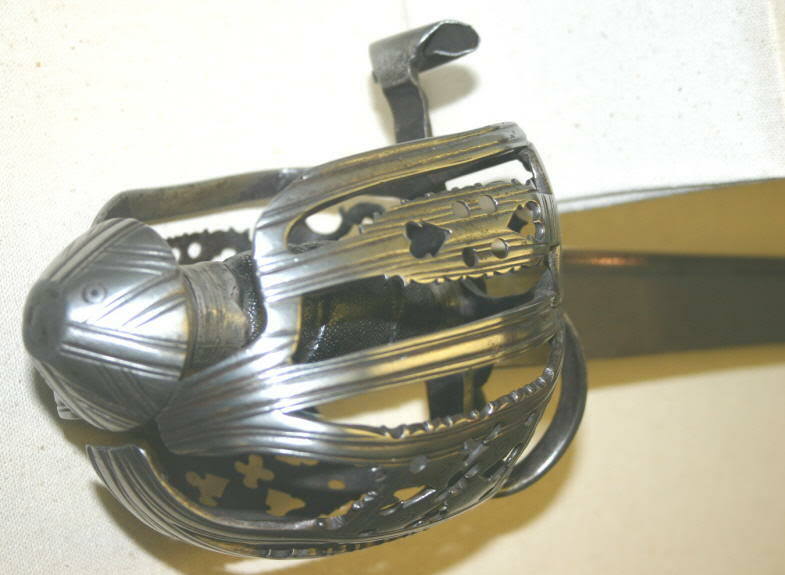 The leather washer in the blade seat leads me to believe this hilt has been apart before (maybe had a liner originally ? 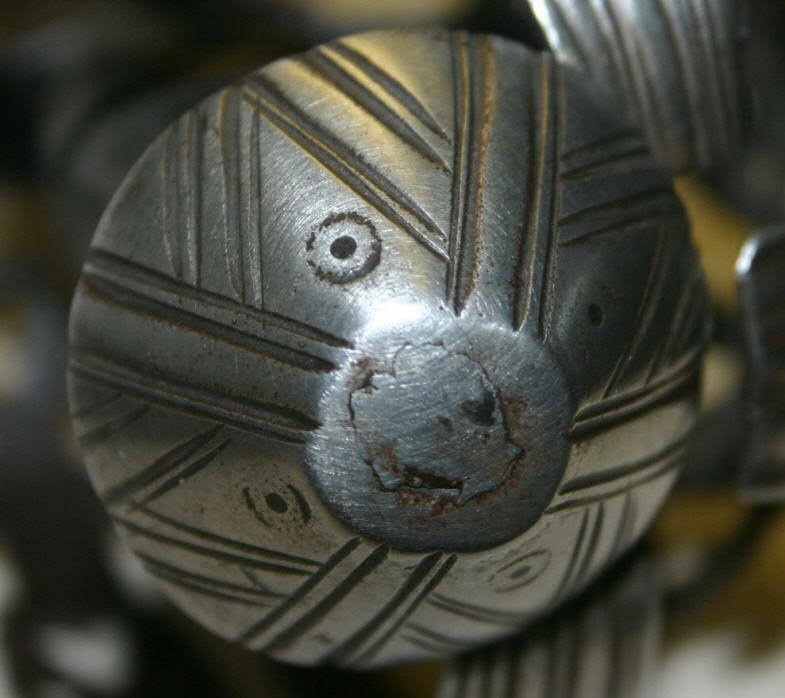 ), and the pommel's peen has me thinking "missing capstan nut, maybe ?"